Extracellular RNA (eRNA), composed of mainly rRNA e.g. released upon cell injury, has previously been shown to have three main detrimental functions in the context of cardiovascular disease: (1) to promote tissue edema by activating the VEGF signal transduction cascade, disrupting endothelial tight junctions and increasing intercellular permeability; (2) to induce thrombus formation by activating the contact phase system of intrinsic blood coagulation; and (3) to increase inflammation by stimulating leukocyte adhesion and transmigration and the mobilization of pro-inflammatory cytokines. This review proposes eRNA to be a possible new drug target in cardiovascular disease. The effects of eRNA could potentially be limited by enhancing its degradation through the naturally occurring ribonuclease RNase. In acute settings such as transplantation or ischemia/reperfusion injury after myocardial infarction, this could be achieved by administering RNase intravenously; however, in chronic situations such as atherosclerosis, a new orally administrable chemical compound e.g. 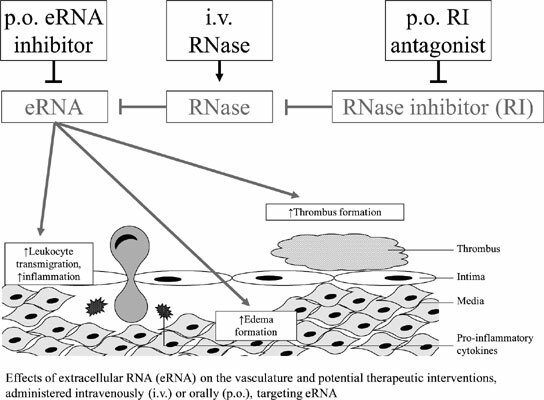 blocking the endogenous RNase inhibitor might be developed. In ischemia/reperfusion injury as well as in acute graft rejection, such an intervention would likely reduce edema, thrombosis, inflammation and cellular damage and hence improve survival. In atherosclerosis, antagonizing the RNase inhibitor would presumably reduce inflammation and slow plaque growth. Crucially, toxicological examinations of RNase administration did not find any adverse side effects, denoting it as potentially safe and well-tolerated. Therefore, eRNA appears to be a promising drug target in cardiovascular disease, and further investigations are required for the possible clinical use of an agent limiting its activity. Extracellular RNA, endothelial cell permeability, arterial thrombosis, inflammation, atherosclerosis, ischemia/ reperfusion injury, heart transplantation, graft rejection.